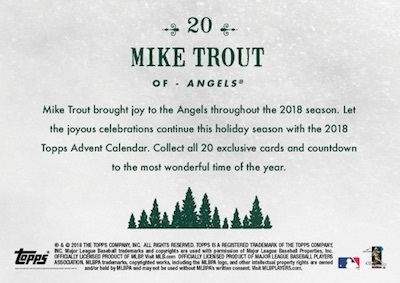 Really getting into the Christmas spirit, 2018 Topps Advent Calendar Baseball helps MLB collectors keep track of the number of work days left until the 25th of December. The online-exclusive set mirrors the Topps Now format with 24-hour selling periods. Many collectors are likely familiar with the idea of an Advent Calendar, but Topps diverts from the norm just a bit. Instead of 24 or 25 days like most display, 2018 Topps Advent Calendar Baseball features a 20-card countdown. This is because the cards are only issued on business days and weekends are skipped. A different card is available every weekday and the cards sell for $7.99 each, or via multi-card bundles: five for $29.99, 10 for $44.99, and 20 for $73.99. Per Topps, they are printed on 16C2S glossy trading card stock. 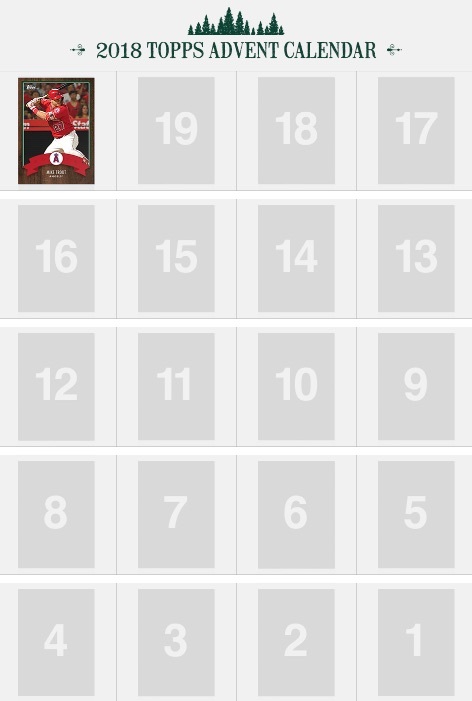 Shop for current Advent Calendar cards on the Topps site. 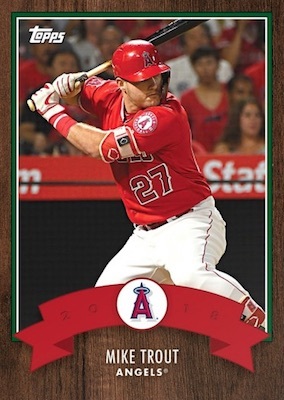 Starting with Mike Trout, the simple wood-framed design adds touches of green and red. As a result, the cards certainly stand out. Backs utilize green text and a Christmas tree graphic to go along with some holiday wishes. There does not appear to be any accompanying calendar to house the exclusive set, nor was there any mention of bonus cards earned by building the full set. Those who need a little more seasonal excitement in their collecting lives should explore the snowflake-heavy 2018 Topps Holiday Baseball. 20 cards. 1 new card per day. Buy current cards on Topps. Print runs added when known. Shop for previous releases on eBay. 2018 Topps Advent Calendar #7 Francisco Lindor Cleveland Indians Only 490 Made! 2018 TOPPS ADVENT CALENDAR CARD DEVERS RC # 13 BOSTON RED SOX - ONLY 541!